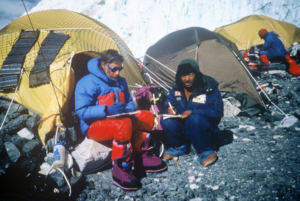 The Ulysses Trust was borne out of a ground-breaking attempt in 1992 by the Territorial Army to achieve the first British winter ascent of Mt Everest (Project DARC STAR), led by Lt Col Philip Neame whilst commanding 10 PARA (V). Everest, then, had only had three winter ascents, by teams from Poland, Korea and Japan, and all resulting in a loss of life. A number of organizations who were approached for financial support proffered the view that the project was too fraught with risk for commercial sponsorship, but that they would be prepared to contribute funds through charitable donations. Philip took the hint, and the Ulysses Trust was formed, taking its name from Tennyson’s inspiring poem about the great ancient Greek warrior and adventurer. HRH the Prince of Wales, already a Patron of the expedition, agreed to become the Trust’s Patron. The thought was always that Project DARC STAR (with the Team by then drawn from reservists of all 3 services) might attract enough funds to create a surplus that could then be ploughed back into supporting future projects by the Volunteer Reserve. This aspiration was realized, thanks to an exceptional £200,000 donation from Robert Fleming, the Merchant Bank, generously, adroitly and with some courage, arranged by Ian Hannam, himself an ex-TA officer with 21 SAS. 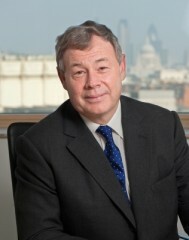 Ian Hannam also agreed to join the founding trustees, and he has continued to provide enthusiastic and generous support to the Trust ever since. The Trust was also fortunate to secure the support of Col David Mallam to become the Trust’s first honorary secretary and fund-raiser, who steered the Trust through its challenging early years. Since its inception, the Trust has provided over £3 million funding support to over 35,000 reservists and cadets variously participating in over 2,700 expeditions at worldwide locations. Today, the Trust’s income comes from a variety of sources, and fund-raising remains an essential component of the Trust’s activities. We also work in strategic alliance with a number of other charities and organisations including the Nuffield Trust, the RAF Charitable Trust, and the Reserve Forces and Cadets Association in order to continue to provide the very best service to our beneficiaries.